Everyone has a story! A winning story or a losing story….or both! 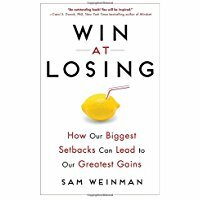 In award-winning sports journalist, Sam Weinman’s book, Win at Losing – How Our Biggest Setbacks Can Lead to Our Greatest Gains, he shares winning/losing stories from professional athletes, business executives, politicians and Hollywood stars and how they hit rock bottom and lost…to win. These professionals realized that losing was actually a stepping stone to where they needed to be now. Weinman is trying to instill in his book, to his own boys and others, that losing is good! It’s healthy! It’s needed! In Win at Losing, Wienman really goes into lengthy detail with some professional athletes regarding the difficulties of losing. (So watch out for a TON of sports background from these athletes that may be a bit much for some people who aren’t sporty and all. And with Weinman being Digital Editor at GolfDigest…do you blame him when it’s his forte? Surely not!) But all in all, this book shares some really good stories that we all can learn from our stumbling careers to get to the top of where we are supposed to be. Life happens along with disappointment and it’s meant to be. Win at Losing can be purchased at Amazon and Barnes & Noble. Beware of some profanity that may be objectionable to some readers. SAM WEINMAN is the Digital Editor of GolfDigest.com, where, during his tenure, the website has grown to boast the largest digital audience in golf and has been nominated for several National Magazine Awards. Prior to that, he was the lead hockey and golf writer for The Journal News and LoHud.com, during which time he launched the popular hockey blog, “Rangers Report.” For more than a decade, Sam’s work has regularly appeared in Gannett newspapers around the country, including USA Today, and he has contributed to Golf World, Yahoo! Sports, ESPN the Magazine, and Sports Illustrated. He is the recipient of several national writing awards for his coverage of the PGA Tour and the National Hockey League. He lives with his wife and two boys in Rye, NY, where he coaches multiple youth sports teams. I will add this book to my “list of books I can’t afford to buy right now” on Amazon! I love these kinds of books, and am so glad to have bumped into your review. If you are looking for more books like this to read, please stop by my page. I post reviews over biographies, classics, and inspiring nonfiction twice a week.